APR 9, 2010 – CALL IT COURAGE premieres at ZACH! 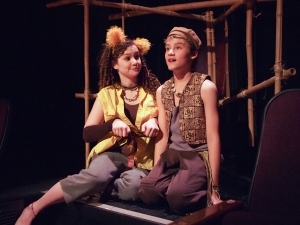 Uri (Hannah Taylor) and Mafatu (Matthew Moore) on their new island. The youth premiere production of CALL IT COURAGE opens at the Zachary Scott Theatre in Austin, TX, performed by the amazing Showstoppers under the excellent direction of Adam Roberts! The show runs till May 9. Mafatu’s name means “Stout Heart,” but he has lived his whole life in terror of the ocean. Now the time has come to face it. With his dog Uri, he climbs into a canoe and sets out on the sea to confront his fears. On the way he will battle sharks, boars, violent storms, and more. Will Mafatu survive to become the brave Chief he was meant to be, or will the sea conquer him after all? Join Mafatu on the journey of a lifetime in CALL IT COURAGE — a tale of excitement, adventure, and self-discovery on the stormy South Seas! More info and news about the show! 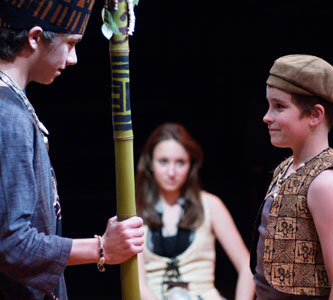 Tavana Nui (Willie Casper) meets his son Mafatu (Sam Pearson), as Kana (Rachel Ravel) looks on. Check out my Writing page — there’s a new clip of Stephanie singing this song, with orchestration by Tony Award-winner Bruce Coughlin! Adam plays Jackie, the romantic male lead, in a reading at New Dramatists of the new musical STORYVILLE, a jazz-based show about a young woman struggling with her future at a house of prostitution in early 1900s New Orleans. Music is by Lisa DeSpain, lyrics by Kristen Anderson-Lopez, and book by Julia Jordan. Adam performs the song “Women Leave” with Mick Bleyer at the BMI Workshop Showcase at the Snapple Theater Center. The song, by Sara Wordsworth (lyrics) and LInda Dowdell (music), is from their musical CHINADOLL OVERDRIVE, adapted from the play by Michael P. Hidalgo. Michael Bush directs and Craig Baldwin accompanies on piano.